OK, so this recipe does tend to read like an endorsement for New Mexico green chile products, (and it's one of the few recipes I depend so heavily on canned, packaged products since I can't actually GET freshly roasted green chiles easily except when I'm actually hanging out in the Southwest) but I have to admit, canned enchilada sauce makes this recipe quick, easy, and delicious. Seriously, I don't think you should use any other chiles if you want REALLY amazing enchiladas. I particularly like the creamy sauce in this recipe as it's rich enough that no fake-cheezy products are needed. One by one, warm corn tortillas (or flour tortillas if you prefer) in an oiled frying pan until pliable, lay on clean plate and put several tablespoons of filling down the center and roll up. Place in 8 X 12 oiled glass or ceramic baking pan, seam side down. 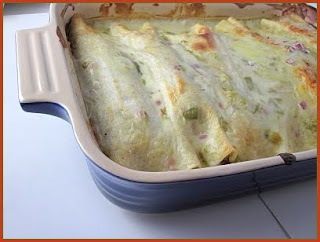 Continue until pan is full, you can "squish" the row of rolled enchiladas together as needed if you have lots of filling to use. If you have leftover filling, spoon it around the edges. Cover with creamy green sauce, poking it down around all enchiladas so they're covered and surrounded. Bake at 350 until hot and bubbly in center - about 45 min. Remove foil and broil JUST for a minute to get top a little brown. Sprinkle with more cilantro and some minced onion, if desired, and serve. This sounds uber delicious...and they look so yummy in the photo...I can just imagine how green and creamy they are on the inside. I think I see some of these in my future, thanks for the recipe. I have to try this immediately! those look awesome! 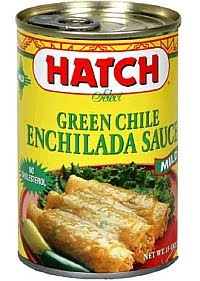 when i was living in austin tx, all the stores and restaurants got a big shipment of hatch chilis in late summer and we ate them in EVERYTHING... now i'm wondering if there's any way to get some here in new york! OMG! That looks and sounds so good! I adore Mexican inspired food, Tex-Mex, Southwest - whatever you want to call it. It's so hard to get "real" Mexican food in Ontario. We had one restaurant here, but it closed and the one that took it's place is a poor substitute. I also have a devil of a time finding fresh ingredients. I have never seen a tomatillo in a grocery store anywhere. I wouldn't know it if it came up and bit me. There are more and more packaged and canned products on the market though. Herdez seems to be the most popular. I'm going to keep my eyes open for Hatch. I may have to wait until I do some cross border shopping. Any other brands and or products you could recommend would be greatly appreciated. In any event, I'm printing this recipe off to try. Wow. This looks absolutely wonderful! I'm such a sucker for good tex-mex food. Question; are the chilis found in the fresh produce section, or the frozen section? I'm in Florida, so wondering where I would best find these. 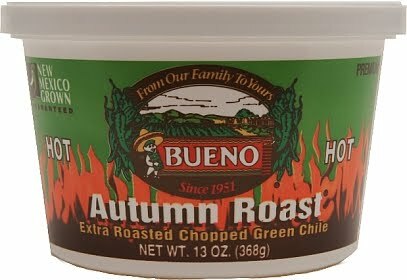 @Vegan Deluxe - you can find fresh green New Mexico green chiles (or use Anaheim chiles) in the produce section of grocery store around this time of year. You'll need to roast them and take the skins off yourself (do a Google Search for "How to roast peppers") OR possibly you may be able to find packages of the fresh-roasted ones in the freezer section OR the tubs of frozen made by Bueno Foods (see the picture at the end of my post).